On May 1, 2004 ZetaTalk that the Earth is being twisted, in a Torque Effect, by the southern half being tugged back by Planet X while the northern half continues to turn. 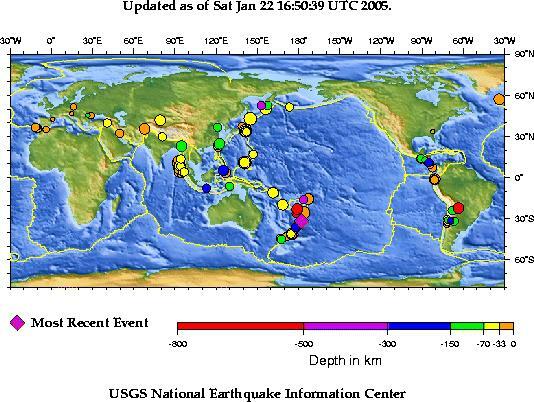 This has excentuated, and explains exactly why the Indio/Australian plate popped as it did Dec, 2004. The overall effect will be a torque. Hold the globe with the left hand on the N Pole, the right hand on the S Pole, and turn in opposite directions. The N Pole going in the direction of rotation with the S Pole held back. Hold the globe as described, left hand on the magnetic N Pole above the Canadian NW territories and right hand on the magnetic S Pole South of Tasmania and you can sense why the Indio/Australian plate was forced to pop. This also explains why there are no quakes along the West Coast during this week, as the pressure is relieved there by the torque. USGS proof of the prophetic accuracy of ZetaTalk. There is no other explanation for this earthquake spread. None. Once again, our words logical, precise, and consistent with prior messages.